The 10 Best Hot Dog Joints in Wisconsin! Go bite for bite with a partner while trying these loaded hot dogs. Being so close to Chicago, the heartland of great hot dogs, Wisconsin gets a small taste of Wisconsin’s version of deliciously decked-out dogs. Our top 10 best hot dog joints in Wisconsin will make your mouth water while tasting one of America’s favorite “on the go” snacks. Martino’s, located in southern Milwaukee is the best place to get a Chicago-style hot dog for under $4. Try out anyone of their delicious dog. Choose from toppings like: Bacon, cheese, chili cheese, sour kraut, and coleslaw. Not satisfied with just a simple hot dog? Try their Grand Daddy dog. Get a taste of Vienna, right in the heart of the Wisconsin Dells. Their eight yummy hot dog styles satisfy the locals—the Green Bay Dog being their favorite. Of course, if you have a picky eater tagging along, they offer gyros, Italian beef, and polish sausage. But if your wallet is shrinking, for under $5, Hot Dog Avenue is a great place to eat. Coney Island Station has been serving up hot dogs since 1922 in the La Crosse area. Single, to-go hot dogs are a hit for those looking for a quick fix, but their well thought out combo meals are what keeps the locals coming back time and time again. With three area locations, they have been brilliantly capturing the hearts of the residents of La Crosse. Doyle’s Dogs is a small hot dog joint located in downtown Lake Mills. They are only open seasonally, but are a huge hit for those in the surrounding areas. The menu is all a la carte. 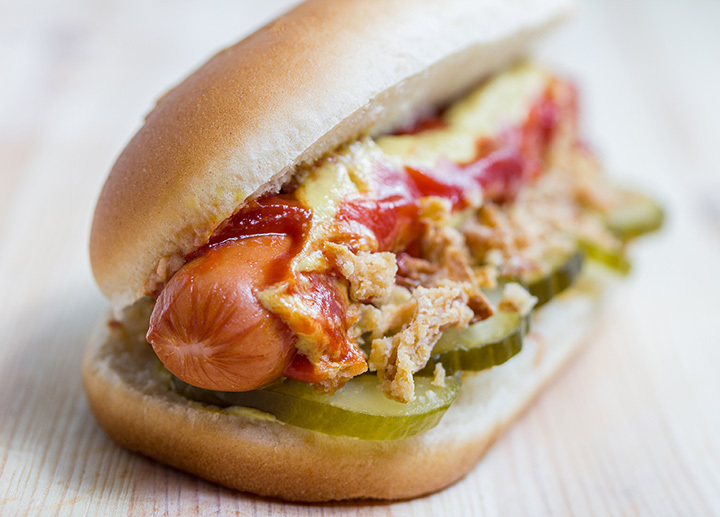 Start with a simple hot dog and top it off with all YOUR favorite fixings. They are even launching a new Business Lunch Delivery Service later this season. Check out this cute corner hot dog eatery located in Kenosha! The story starts in 2003 for Trolley Dogs. They have been locally owned and operated and have accumulated quite the following of loyal customers. With their made fresh jumbo Vienna hot dogs and Chicago style toppings there’s no guessing as to why! This is one dog house you’ll want to be in! Located on Marquette University in Milwaukee—the Dogg Haus has earned Best Hotdog in Milwaukee for four consecutive years. From their specialty dogs to their “Build Your Own” options, there is literally a dog out there for everyone. OSS Madison offers a cute patio bar and serves up the best hot dogs in Madison. The restaurant that struck up the question of “What does O.S.S. mean?” Their response—“arrive at your own conclusion.” So, stop of by OSS and grab a hot dog while brainstorming the true meaning behind OSS. Yes, you read that right. Another Dawg House specializing in decadent hot dogs for purchase. Located right off Highway 35 in Lynxville lies a crowd countywide pleaser. They are open from April to October. Try their famous foot long the Big Dawg! Claw’s offers a large 85 item menu, serving their classic Chicago-style hot dogs. Melted cheese, and crispy fries, with a fully loaded hot dog will make your taste buds scream. Seven Chicago-style hot dog options and tons of other menu items serve up for a great place to stop with the entire family. Every hot dog served at Hot Dog Charlie’s is served up with a smile. Hot Dog Charlie’s takes pride in their top-notch customer service and their fine quality product. Their world-famous bacon sauce is a hit that can be doused on any hot dog. Their old-school diner mixed with a traditional house hold taste keep the locals coming back for more.